1. Chanukah is one of the three major holidays (the other two being Purim and Simchas Torah) that was established by Chazal (the early rabbinic sages). As such, it shows the importance of human interaction in the development of the spiritual process, and the need of human interaction to fulfill the Divine will. Even though the holiday of Chanukah was established by Chazal, the blessings that we recite over the candles cites G-d as commanding us to light them. This is because G-d wants human interaction, human thought, and human processes to go into the reciprocating process of creation, and He Himself commanded humanity to do so. Thus, the creation of Chanukah is a fulfillment of this command, and we can make a blessing citing G-d as the "commander" of the holiday. 2. The Chiddushei HaRim, the first Gerrer Rebbe zt"l, writes that the act of lighting the menorah is not simply a commemoration of the miracles of Chanukah, but that we actually see the miracles in our own lights. This is shown by the fact that we say "haneiros halelu", or "these lights" are holy, not simply the ones in previous times. Reb Levi Yitzchok of Berditchev zt"l, the Kedushas Levi, writes that each year during Chanukah, the strength and miracles of the original Chanukah are put into the world. The result of this is an intense potential for spiritual enlightenment, which he says can be felt to the extent that we withdraw ourselves from physicality and attach ourselves to spirituality instead. The Sfas Emes, grandson of the Chiddushei HaRim, says we can do this by allowing the mitzvah of lighting the menorah to help us connect to that which is beyond the natural world. This is, indeed, the entire point of mitzvos, as they are meant to turn the mundane world into a continuous spiritual endeavor. 3. 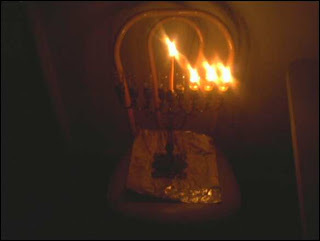 While Chanukah is celebrated for eight days, the miracle of the lights itself did not last for eight full days. 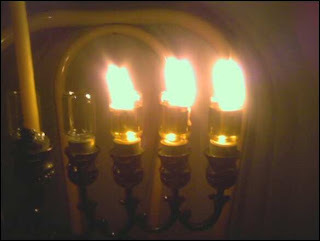 Because enough oil was found to last one day, the miracle of Chanukah is truly only seven days. The Beis Yosef, a prominent legal scholar of the 1500's, famously asks this question in his writing. While there are many answers given by various authorities, and answers continue to be suggested, I have a personal favorite. The answer that speaks to me the most is that at a time when all seemed to be destroyed, after having taken back the temple from the hands of the Greeks, and seeing that they had completely defiled the temple, the fact that they still had enough hope to even look for pure oil is itself a miracle. Therefore, we celebrate the holiday of Chanukah for eight days: seven for the oil, and one for the perseverance of hope and trust in G-d, even when it seems to not make sense. 1. Did you write these articles yourself? 2. Why do you put a dash for the 'o' in God?